I don’t know whether the allegations against Judge Kavanaugh of sexual assault are true. Neither do you, and neither do the partisan pundits on cable news and twitter. What I do know is that - at least until more information materializes - enough people believe the accusation to seriously undermine his nomination. On PredictIt, the political betting market, on this day last week, Kavanaugh had an 87% chance of being confirmed this month. * Now he’s at 39%. Key swing votes for Kavanaugh have slipped too; Sen. Heitkamp went from 80% to 27%. You might well ask, “Why not withdraw Kavanaugh and put Amy Barrett in his place?” If Kavanaugh is guilty or innocent doesn’t matter: a significant portion of the population has already made up their mind. At this point, likely 20-40% of the population thinks Kavanaugh is guilty and won’t have their minds changed. A protracted investigation with hearings and constant media coverage won’t make Kavanaugh any more popular. So why not drop this whole thing and nominate a woman (who is actually more popular with conservatives than Kavanaugh) in his place? Think about how hysterical the Dems have been about Kavanaugh, how much effort they’ve put into derailing his nomination. Does anyone really think they could do the same for Barrett? Any attempt to smear her the way they smeared him will come across as even more transparently partisan. Nominating Barrett could be the smart short-term play. But that doesn’t mean Trump should do it. There’s a long-term moral question here: Are we going to let vague and unsubstantiated claims of sexual assault sink politicians? Any man nominated for any position, or running for any position, could have their career and reputation ruined by mere accusation by a politically motivated busybody. I’m not saying that’s what's happening with Kavanaugh, I’m saying that’s what could be happening with Kavanaugh, and could happen with anyone. The President also has a personal stake in this fight: supporting Kavanaugh or dumping him could play into his 2020 chances. Conservatives are in full-on reflexive kneejerk reactionary mode when it comes to sexual assault allegations: most of them (us?) 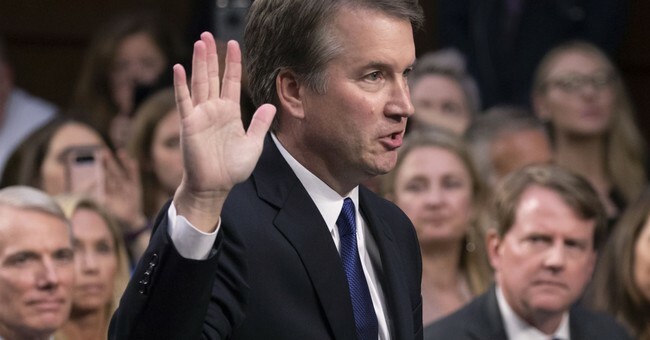 want him to stand by Kavanaugh, because they (we?) feel that this accusation is a cynical political stunt. Trump risks upsetting a large portion of his base by dropping support for Kavanaugh. On the flip-side, a willingness to believe the accuser and replace an accused sexual assaulter with a woman could help woo back Republican women who have been alienated by Trump. *Technically the market is for any SCOTUS nominee to be confirmed, but that means Kavanaugh by default, as it would be difficult (though not impossible) for the administration to pick a new nominee and get them confirmed in the next two weeks.